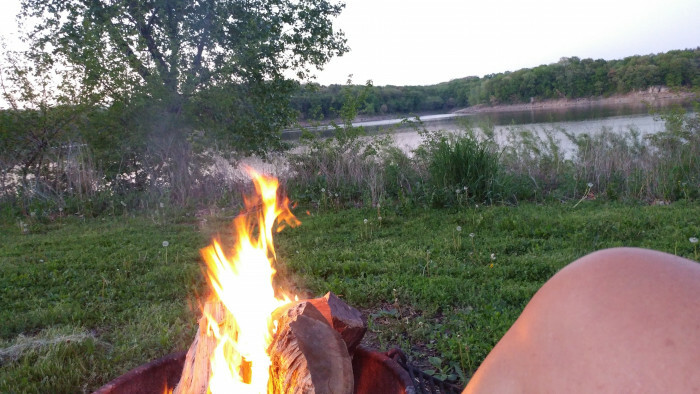 Ask fellow campers about "West Overlook COE" and nearby attractions. We stayed in the Tailwater West section of this campground. (There are at least 4 sections, West Overlook, Tailwater West, Tailwater East and Cottonwood. ) Tailwater West has about 20 sites and seems tailored for big rigs. There are two pull thru sites and the rest are large back-in sites. There is no office at Tailwater West. After arriving, you need to drive over to West Overlook to check in. The dam is right "above" our site and we could hear water rushing by all night. A clean, safe, friendly Corps of Engineers campground. And a great value at $13 using the Senior Pass. We camped at West Overlook COE in a Fifth Wheel. We had a beautiful site on the lake, electric only. There is a dump station on the way out. The bath house had 3 toilets & 2 shower stalls. There isn't a convenient place to dump your garbage, but we were only there one night, so not a biggie. Make sure you follow the directions on the website, as the GPS leads you to the visitor center in the wrong direction. We camped at West Overlook COE in a Motorhome. We love Coralville Dam Complex!! Great camp sites and fishing is in walking distance or you can drive to more fishing areas. People are friendly. There is no water at campsites but you can fill tanks at dump station if you don't want to haul water while traveling We camped at West Overlook COE in a Motorhome. Close to Iowa City for shopping, eating etc. Home of the Iowa Hawkeyes. North Liberty has several eating establishments that are very good. Had a great site W49 at this COE campground. 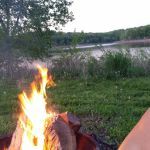 Situated on Coralville Lake, IA, this was a great pick for an overnite on our cross country trip on I80. This campground would be a great camping destination. 2 bars on Verizon. Our site was electric only. Gravel site with paved interior roads and grass between sites. We backed up to the lake for a gorgeous view. We camped at West Overlook COE in a Travel Trailer. Level site, clean power, very nice campground. Did not use bathrooms or showers. Easy drive off of I-80. Excellent value with America The Beautiful card. We camped at West Overlook COE in a Fifth Wheel. This is another great COE park. The staff was courteous and helpful. If you do not have a COE book, get one. The parks can be difficult to locate. The standard fee here was 20$, but with a "Geezer Pass" it was 10$ and if you are eligible and don't have that card, get one. We were only looking for a shower and an overnight with electric as we didn't or want anything more. The setting is beautiful. We camped at West Overlook COE in a Motorhome. You will have to look, this is on a lake. There is a lot going on. There are trails and a boat launch and a lot of other things we didn't even look for. Great COE park, probably the best we've stayed in. West Overlook is at base of the dam and right on the river. Sites are mostly back-in, but long with concrete pads and we had FHU. Some shade trees, but did not interfere with satellite reception. Nice quiet area. Will stay there again when in area. We camped at West Overlook COE in a Motorhome. Close to Amana Colonies and other touristy places, including where James T. Kirk will be born in the future! There is fishing, if you want, with a fish cleaning station right there. For a day trip, it is about 50 miles to Dyersville where they filmed FIELD OF DREAMS and also the I-80 Truckstop, billed as the LARGEST TRUCKSTOP IN THE WORLD. Reserve sites are premium sites first come sites are good but few. Water is located at the dump station and the dump is located on the right side before you get to the front gate. 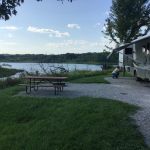 We camped at West Overlook COE in a Fifth Wheel. I'm a little confused about the "music and bands," and ruined weekends? I live in Iowa City and we camp at West Overlook regularly. Never have had a problem, ever! The only thing I notice as a problem, and this is nation wide, is that it is very tough to get into on the weekends. Any site that is reservable, is reserved. Makes it almost impossible to do the "let's go camping this weekend" thing. We do a lot of during-the-week camping and commute back and forth to work, stop at the house daily, mow the lawn, etc., and still feel like we're on vacation. We highly recommend this campground, but make a reservation! 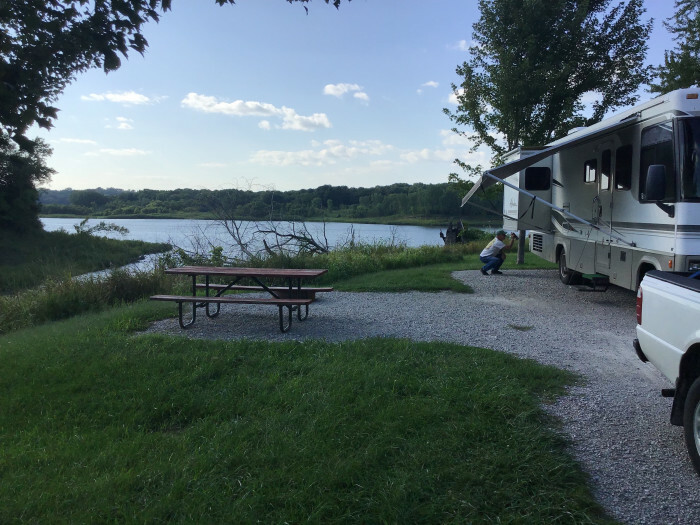 We camped at West Overlook COE in a Fifth Wheel. Very nice campground (Army Corps), however, be aware that a day use shelter house is adjacent to the campground. The rangers allow low music, even bands, to play at the shelter. We have had two weekends ruined because of this, and will not return to this campground. We camped at West Overlook COE in a Motorhome. Are you affiliated with West Overlook COE ?